The Verdict Is In: We Deliver IT Services Second to None. In law firms today, every minute counts. If your technology fails at a critical moment, it can spell disaster for your clients and your business. Don’t put yourself through that! At Vantage Point, we have years of experience implementing and maintaining technology at law firms throughout the region. We’re even familiar with specialized legal software such as Juris, Amicus, PC Law, Timeslips, and TABS — so you never have to wait on us to get up to speed. But that’s only the beginning. 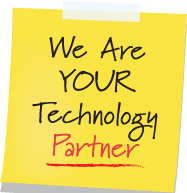 We can customize your technology to fit your firm’s unique needs so you can improve your capacity to support clients, grow your caseload, administer policies, track billing, and maintain confidentiality. We focus on technology day-in and day-out. We’ll not only keep your systems running, we’re ready with recommendations when an upgrade or new technology will help your practice run more efficiently. So stop worrying about your technology and concentrate instead on serving your clients and growing your practice.